During the last two session's of Little Man's practice days with the kleuterschool, I have discovered something unexpectedly wonderful. At his school, children eat lunch in the classroom. Which means that I am eating lunch. Alone. And it is glorious. It's been a while since I've eaten a lunch without the Little Man around. 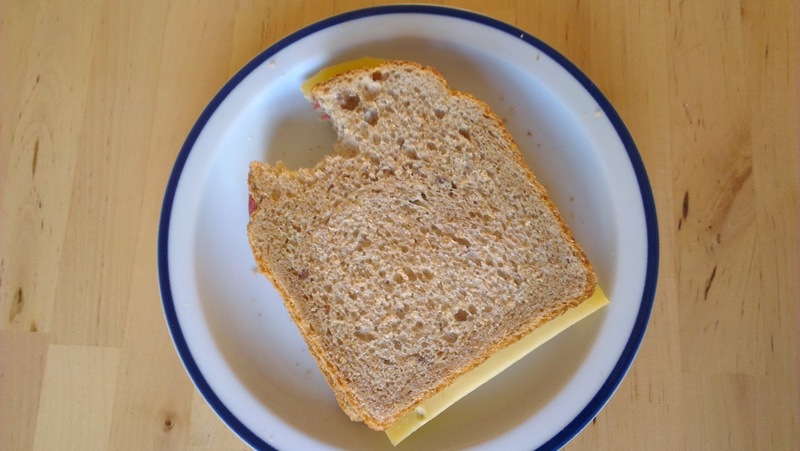 Anyone who has eaten a meal with kids has probably experienced something like this: You make some sort of sandwich as fast as you can for the person that decided they are STARVING once they saw you take out the ingredients, and get it on the table before they pounce. Once that's done, you try to make something for yourself even faster because somehow the child is already almost done eating. Then, you eat like a bird. Not terribly majestic, is it? I've now had a couple of chances to eat by myself, and it has been surprisingly relaxing. I can take my time. I can chew. And I don't have to defend any part of my sandwich. 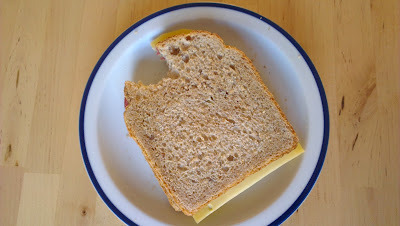 Do you know what's unique about this picture of my sandwich? There's no little hand looming over the sandwich, ready to strike. I'm glad Little Man is enjoying school, and I'm happy to see him at the end of the day. But I think I'm going to get used to eating on my own again. Did you discover something great about your kids starting/going back to school? Or is there one thing you can't wait to be able to do once the kids are in school? I still have a year or two before I get to eat lunch completely on my own... but I can not wait!! It's coming! Just keep faith! It will be so great once it arrives. Thanks for stopping by! I do not have children yet so do not know from firsthand experience, but when I was a teacher and we would do outings - it was pretty much like that! Loved this post! Enjoy your lunch! Ahhh the little thing aye. Perhaps Mama needs to take herself to a fancy restaurant for lunch next week? No prep, no dishes and a waiter. Ha! Not quite, my lunch is pretty simple. but I will take time to savor.